Ad for the Belk's Dept. Store in Rock Hill, S.C.
Ca. 1910 image of downtown Rock Hill looking east. Note the early cars as well as the trolley tracks which turned from Main Street onto North Trade Street. This section of East Main Street is the highest point in downtown Rock Hill. It became the location of numerous businesses, including the Bailey’s Tin Shop and the home of one of Rock Hill’s early doctors, John W. Fewell. This home burned in ca. 1912, leaving a vacant lot ready for development. The current building was designed by Rock Hill architect A. D. Gilchrist and originally cost some $100,000., to construct when built in 1930. 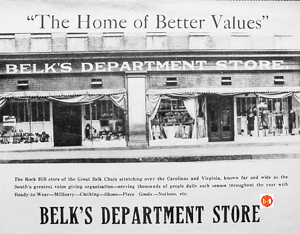 The department store was a mainstay of commerce on Main Street for decades and for generations of local citizens Belk’s was their store of choice. The store later relocated to the Rock Hill Mall and the facility became the Rock Hill City Club, which ceased operations in 2017.